Take a bowl and beat 4 eggs with a little salt and pepper. Now take a pan and heat 2 tablespoons of oil and the beaten eggs and fy it. Make sure you only half fry the eggs and keep it aside. Again in the pan heat 2 tablespoons of oil and add the onions and sautÃ© for a minute. After it is half done add the remaining vegetables and salt fry till they become a bit tender . Make sure not to overcook the vegetables as the vegetables needs to be a bit crunchy.Add the cooked eggs to it. After the vegetables are done add the soya bean sauce and vinegar to it and sautÃ© for another minute. 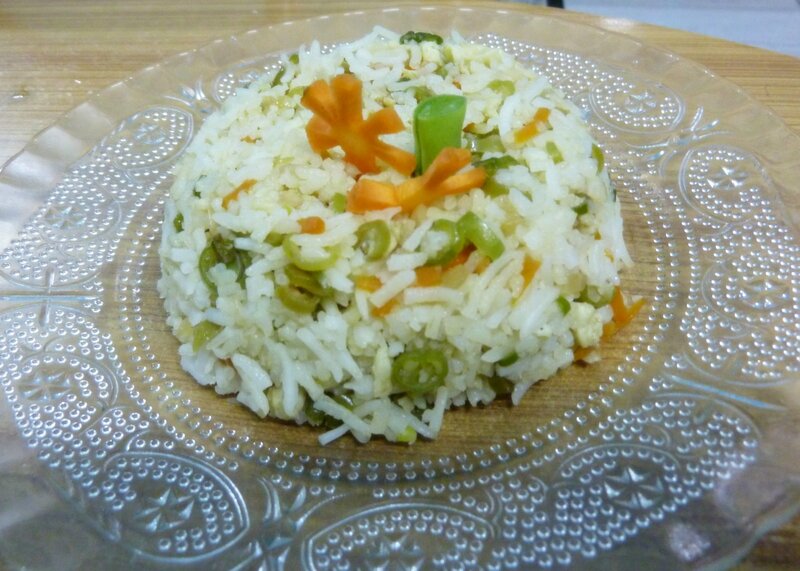 Now add the cooked rice ( I add the required salt while cooking the rice so that the salt is uniformly mixed) to this mixture of vegetables and mix them well. Your egg fried rice is ready to eat. Serve it hot with any side dish you like.